“Focusing is a practice that honors what arises freshly in the moment. Frozen structures of any kind are antithetical to the ethic of Focusing. and its application in different fields will not be standardized. The Weeklong is coming closer and closer. People have started to register from all over the world, including China, Korea, and the USA. As always there will be a great variety of backgrounds, cultures and languages. The world needs diversity. In order to reach “a substantial proportion of populations in all countries and cultures and social classes” (Vision statement TFI) diversity is needed. The more diverse we are -- with a wide variety of approaches, connections, and models -- the more people we can reach. Diversity is one of the pillars of the Weeklong. 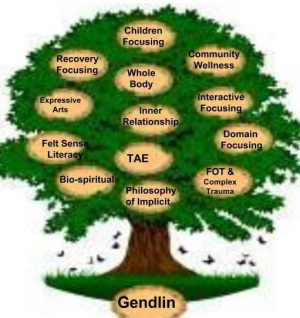 For those who are not familiar with more than one Focusing style we will offer introductions to different styles such as Domain Focusing, Inner Relationship Focusing, Interactive Focusing, Bio Spirituality, and the How We Heal model for community wellness. We will encourage Diversity by inviting and stimulating the participants to find their own way of teaching Focusing and to follow their felt-sensing creation of new approaches and models. We will invite them to share and to cross with all the other colors, knowing we all will grow in this connecting and crossing. And we will celebrate all the existing and new Diversity. During an open space participants will be invited to share their Focusing practice and listen to how it touches other participants. Relating to this, we will invite the participants to experiment with opening up a space filled with curiosity, and allow, as much as they want to allow, the practice of another focusing practitioner(s) to touch and apply itself to their own familiar practice. And in this creative interaction which Gendlin calls ‘crossing’, sense for whatever comes. What comes will be surprising! There is diversity in the teaching team as well! If you want to get a glimpse of the Diversity of the teaching team please listen to the podcasts that are coming up in the next three weeks!